The recipe for this cake, one of the most precious gifts I’ve ever received in my life, comes from a generous Swedish friend, Ragnhild Langlet, a textile artist of extraordinary talent. The cake became an immediate favorite in our household, an honorary Parsi dessert and our most requested birthday cake. We met Ragnhild Langlet in a Berkeley garden in the early summer of 1987 at a potluck wedding celebration to which she brought an unassuming cake baked in an unassuming pan. That unassuming little cake was one of the most powerful things I’ve ever tasted. It was suffused with a scent of cardamom, crunchy whole seeds throughout, sweet enough, rich enough, light enough. Cake perfection. The taste is so exotic, so tropical, yet so adaptable to any cuisine that it’s a surprise to know that it comes from Sweden, which turns out to be the world’s second-largest market for cardamom, India being number one. This cake is excellent the first day, even better the next and the next and the next, if it lasts that long. Serve with fruit or a custard or ice cream. There’s nothing that it doesn’t complement. • Heat oven to 350 degrees. Prepare a 9-inch diameter springform pan by buttering it liberally, sprinkling 2 to 3 tablespoons sugar, and shaking the pan until the bottom and sides are coated with sugar. Don’t worry about extra sugar on the bottom. Cover the bottom with sliced almonds if you want a particularly crunchy topping. Ragnhild also suggested ground almonds or bread crumbs. If you want to be absolutely sure that the topping won’t stick, use a parchment paper disk to line the bottom of the pan before buttering and sugaring it. • Using a stand mixer if you have one, a handheld beater, or a powerful and patient arm, cream the eggs and sugar until thick and pale and tripled in volume, about 5 minutes. Melt the butter in a little saucepan. Bruise the cardamom seeds in a mortar. Quickly fold the flour and salt into the egg and sugar mixture, followed by the butter and the cardamom. Give the batter a thorough stir before tipping it into the prepared pan. Thump the pan on the counter to settle the batter. • Bake the cake for 30 to 35 minutes. The top should feel dry and spring back when lightly pressed, and a skewer or knife inserted into the center should come out dry. Remove from the oven and leave in the pan about 5 minutes. 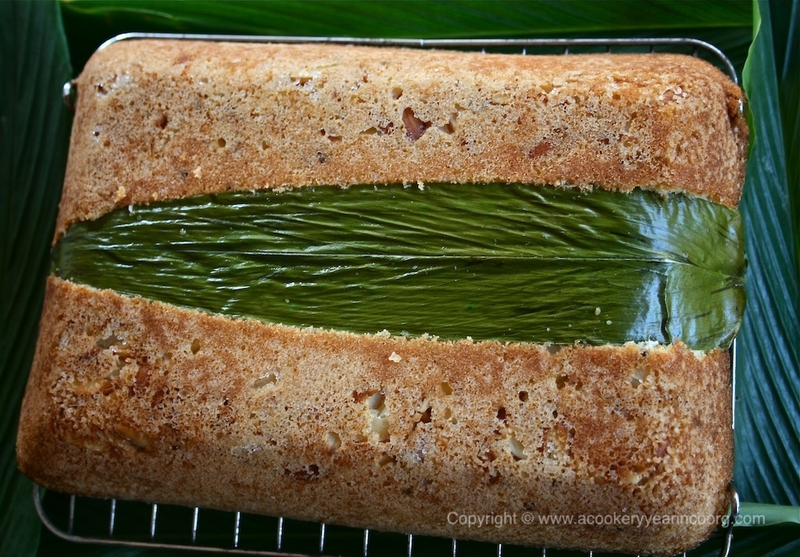 Run a knife around the sides of the pan before inverting the cake onto a rack to cool. Remove the bottom of the pan carefully while the cake is still very warm. Let cool before serving. For our dear friend Catherine’s birthday in 1987, I embedded rose geranium leaves in the top of the cake (actually the bottom of the springform pan) along with the almonds, and served it with a winter fruit compote also lightly scented with rose geranium. If you can ever get near a cardamom plant, which is a member of the ginger family, try a leaf from it, too.